This lovely dress is very flattering, with its elastic above your baby bump and a gorgeous kimono style sleeve. 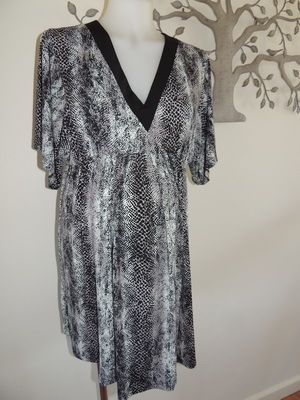 It is in a lovely black and white snake print and there is plenty of stretch in the fabric. It is new with tags by Ninth Moon. The dress has a flattering v neckline in black. Be the first to review “NEW Snake Print Kimono Maternity Dress” Click here to cancel reply.